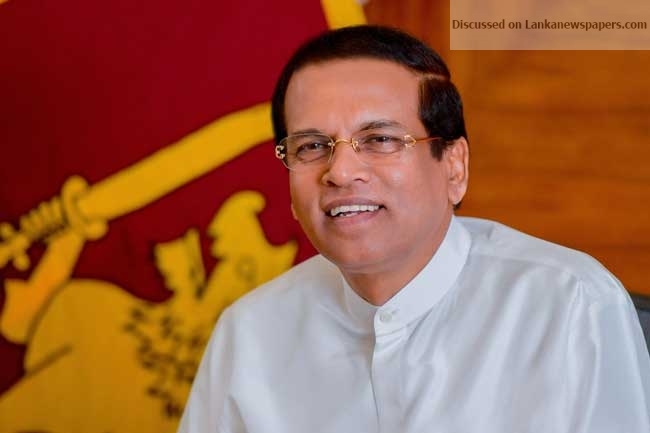 Issuing a special statement, President Maithripala Sirisena addressed the nation this evening (11) with regard to the dissolution of the parliament. President Sirisena states that one of the reasons behind the dissolution of the parliament was the ‘tragic situation’ that the value of MPs elected by the people, was commercially evaluated. According to President Sirisena, the second reason that led to the dissolution of the parliament is the former Speaker Karu Jayasuriya’s ‘peculiar’ behavior by disregarding standing orders and parliamentary conventions and attempt of refusal to accept the Prime Minister appointed by the President. President stated that the need for averting any untoward incidents that would have occurred at the next parliamentary session on the 14th November is also a reason that brought on the dissolution of the parliament. He also requested all parliamentary members, excluding the Prime Minster and the Cabinet Ministers, to immediately handover the state property –vehicles and other resources –allocated for them, to the relevant secretaries. The request was made to all state ministers, deputy ministers and former ministers and MPs. President further stated that failure to do so will require him to take necessary action. President Maithripala Sirisena called on the public to give their support to hold a fair, just election and to elect intelligent and experienced representatives to govern. “This is the third occasion in 14 days I am addressing you to explain recent developments. First, on October 26 I explained my views to you after appointing Mr. Mahinda Rajapaksa as Prime Minister. Then, at the meeting held at Ape Gama in Battaramulla on 5th November, I explained the political views to you. Today is the third occasion and significantly, this is the first time I address you after dissolving the Parliament. First, I must tell you the circumstances leading to the dissolution of the Parliament very briefly. Our Parliamentary System began in 1947 after the end of the State Council System. Since then, the country was governed over the years with holding of elections and changing of governments. By the last week, in the highest institute that represents people’s supremacy to usher in a disciplined, ethical ad cultured society, the individual worth of Members of Parliament was estimated as Rs 100 million to Rs 150 million, and in one instance as high as Rs 500 million. We have experiences about several political crisis and changes in the past. I remember the political crisis due to the opposition to the Lake House Bill in 1964. The government was changed due to that. However, since 1947 we have not seen of dissolution of parliament due to issues of corruption. The Central Bank robbery after 2015, the involvement in various corrupt practices since then and finally the political crisis during the attempts to show the majority support after the appointing of Mr. Mahinda Rajapaksa as Prime Minister and the value placed on Members of Parliament as I mentioned earlier were extremely unfortunate developments. All of you will acknowledge what a tragic situation in politics when the value of the Members of Parliament, who were elected to represent the people, were commercially evaluated. That was one of the main reasons for the dissolution of the Parliament. The second reason was the most peculiar behavior of the former Speaker, Mr. Karu Jayasuriya. I am extremely sad about that. He is a good friend of mine. The Speakers of our Parliament since 1947, until now, traditionally conducted themselves in neutral and most impartial manner. I wish to state, that his behavior of disregarding Standing Orders and Parliamentary Conventions and attempting not to recognize the appointment of a Prime Minister by the President exercising his Presidential powers was the second reason for dissolving the Parliament. I must remind you here that, as we take the situation in to account politically, following my victory on 2015 January 08th, when I appointed Mr. Ranil Wickremesinghe as the Prime Minister on the very next day, he had the support of a mere 41 members in the Parliament, whereas the sitting Prime Minister D.M. Jayaratne had the support of 162 members in the Parliament. At that moment, as you know, those who talk about the majority today, were silent about that. Often, the custom is to appoint among the members of the Parliament, someone whom the President, in his opinion, can trust to get the support of the majority in accordance with the constitution. Following that appointment, the support of the majority is obtained in terms of the standing orders of the Parliament and in the Constitution of the country. However, in our Parliamentary tradition, there has been no occasion on which the majority support for a newly appointed Prime Minister has been tested by vote. Nothing of the sort happens under the standing orders. However, the second statement by Hon. Karu Jayasuriya violated those traditions. In his first statement, he accepted the appointment of Mr. Mahinda Rajapaksa as Prime Minister and stated that he would provide the rights and the privileges of the Prime Minister to him in the Parliament. That means, specially reserving the seat of the Prime Minister and the Office of the Prime Minister in the Parliament. His first press statement admitted this. However, his second statement was a complete deviation from it. In that he stated that he recognizes Mr. Ranil Wickremeinghe as the Prime Minister. I paid serious attention to this development. Members of Parliament from both sides issued various statements in media, that there would lead a big fight when the Parliament is convened on the 14th November. Some speculated that even death of some members would occur. It appeared to me that, if I allowed the Parliament to be convened on the 14th, without dissolving it, it could have brought about commotion and fights, in every city and every village would lead to very unpleasant and difficult situation for the average citizens of my beloved country. As such, the best solution was not to allow those 225 members in the Parliament to fight each other and allow that to develop into a street fights in every part of the country. It is my duty and the responsibility to take democracy to guide us, and create the situation for the fifteen million voters in this country take the ultimate decision by choosing their members to the Parliament through a free and fair election. As such, given the corrupt practices among Parliamentarians as well as the conduct of the Speaker, the best and fair solution to the political crisis that emerged was to allow the people decide in keeping with the principle of democracy. It was with that noble intention of upholding democracy that I dissolved the Parliament. I must state that a permanent and a clear solution to the current situation can be reached through a General Election. The ultimate responsibility of holding the election rests with the elections commission. We need to extend our fullest support to the election commission. I humbly make the request from all those involved to extend their unwavering support to the elections commission, officers on election duty and the Tri-forces and the Police in their respective duties. We have chosen a new government. Now it is up to you to defeat the corrupt and elect clean Parliamentarians to represent you. I consider the decision uphold democracy by calling a general election is a welcome by all. The solution to many burning issues in the country such as the current high cost of living, achieving a prosperous economy, strengthening local industries, obtaining clean foreign investments, building a cultured and disciplined society, and strengthening democracy is to conduct an election and give the people the choice. For this, purpose we take our Motherland to a new path. In order to create an intellectual young generation suitable for the technologically advanced world, we take steps while preserving our heritage of customs, traditions, ethics and culture for the present generation as well as the future generations. Furthermore, you have an excellent opportunity now to elect intelligent and experienced representatives to govern. Hence, we give fullest support to the Gazette Notification on holding of General Elections and the steps taken by the Elections Commission accordingly. Here, I would like to remind you about one or two areas in which electoral laws have been violated in the past. Firstly it is essential to stop misuse of public assets for the electioneering of political parties or candidates. Use of state vehicles for election campaigns must be stopped. As you are aware, during the former government as well as during the current interim government, the Ministries were provided with vehicles for the use of Members of Parliament. Today, we have an interim government comprising of the President, Prime Minister and Ministers. Under the 19th Amendment to the Constitution, the interim government will function during the elections period until a new government is established. As you know only the President, Prime Minister and Ministers are functioning in the interim government and in accordance with the regulations of the Elections Commission none of the former State Ministers, Deputy Ministers or MPs could use official vehicles for the election campaign. I request with respect to all the former Ministers and MPs to return their government vehicles to the Secretaries of Ministries immediately. If they do not act accordingly, I will have to ask the police to confiscate the vehicles and I will not hesitate to take strict legal action against the defaulters irrespective of their political party affiliations. I would like to kindly remind that use of government vehicles and public assets for elections is illegal and it should not be done.